If you prefer, just view search results. Good low latency cl9 at 1866mhz ! Nice kit corsair pro DDR3 gaming ram (very low latencies). Serial numbers of ram sticks have been recorded to prevent fraud, as shown in listed pictures and manually written here . Amd Radeon Memory R7 Performance Series 16GB (2 X 8GB) DDR3-1866 MHz CL9. Condition is Used. Dispatched with Royal Mail 1st Class. 8GB (2 X 4 GIGABYTE) HYPERX FURY. DDR3-1866 (PC3-14900)240 PIN RAM. RAM has been checked with a test program, it was 100% stable with no problems reported and is in excellent working condition. PN: HX318C10FWK2/8 1.5V ~MATCHED PAIR. 8GB (2 X 4 GIGABYTE) HYPERX FURY. 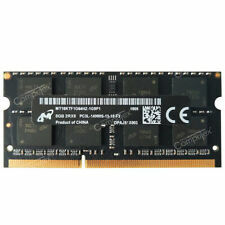 DDR3-1866 (PC3-14900)240 PIN RAM. RAM has been checked with a test program, it was 100% stable with no problems reported and is in excellent working condition. PN: HX318C10FRK2/8 1.5V ~MATCHED PAIR. 8GB HYPERX FURY. DDR3-1866 (PC3-14900)240 PIN RAM. RAM has been checked with a test program, it was 100% stable with no problems reported and is in excellent working condition. HyperX FURY 16GB (2 x 8GB) DDR3-1866Mhz. Condition is Used. Dispatched with Royal Mail 1st Class. HyperX HX318C10FRK2/16 FURY 16 GB (2 x 8 GB) 1866 MHz DDR3 CL10 DIMM . Condition is Used. Dispatched with Royal Mail 1st Class. Size 8GB(2x4GB). Speed 1866 MHz DDR3-1866 PC3-14900. Manufacturer Kingston. We Also Record Serial Numbers. Add to Favourites. 16GB OF HYPERX FURY. 1.50V (2 X 8GB PAIR). 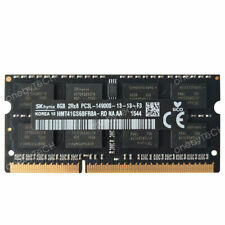 DDR3-1866 (PC3-14900) DESKTOP PC RAM. TAKEN FROM MY LATE 2015 RETINA 27 INCH IMAC. WORKING FINE WHEN REMOVED ONLY REPLACED DUE TO MEMORY UPGRADE. PLEASE SEE PICS FOR SERIAL NUMBERS TO CHECK YOUR MACHINES COMPATIBILITY. Condition is Used. Sold as shown. More informations and Ballistix M.O.D Utility tool you can find on Crucial website. Programmable LED patterns. HyperX FURY is available in frequency speeds from 1333MHz to 1866MHz. Even newbies get up to speed fast, since FURY automatically recognises its host platform and automatically overclocks to up to 1866MHz, providing plenty of power for your next death match. CT102464BF160B is a single 8 GB DDR3L 1.35V Notebook module that operates at speeds up to 1600 MT/s and has a CL11 latency. It is unbuffered and is non-ECC. Product is genuine original from manufacturer authorized distributors. Rank: 1RX4. Capacity: 8GB. All of our RAM sticks are tested before dispatch. A forklift is not required. We are aware that mistakes and problems can always occur but we will endeavour to get any issue resolved as quickly and fairly as possible. 100% working - no errors. This item has been fully checked and has passed all diagnostic tests..
You can increase efficiency by a simple, low cost upgrade without compromising on the quality. Ortial Technologies DDR3 modules are one of the most cost effective and efficient ways to speed up a server. Ballistix Tactical Tracer DDR3 1866MHz 8GB RAM. CL9 @1.5V UDIMM. 8GB Kit (4GBx2). Corsair DDR3 16GB (2x8GB) 1600MHz CL10 1.5V Corsair Vengeance. Corsair Dominator 16GB (2x8GB) DDR3 Ram CL10 1.5V. DDR4 2133MHz RAM 4GB Corsair Value Select CMV4GX4M1A2133C15 1.2v. 16GB (2 X 8 GIGABYTE) HYPERX FURY. DDR3-1866 (PC3-14900)240 PIN RAM. RAM has been checked with a test program, it was 100% stable with no problems reported and is in excellent working condition. PN: HX318C10FBK2/16 1.5V ~MATCHED PAIR. Crucial CT2C8G3S186DM. CT2C8G3S186DM is a 16 GB Kit consisting of (2) 8 GB Single Ranked DDR3L 1.35 V Notebook modules that operates at speeds up to 1866 MT/s and has a CL13 latency. It is Unbuffered and is non-ECC. Condition of this unit:All our units are second user & may contain slight marks or scuffs to the casing however not affecting the functioning or use. Bus clock rate 1866 MHz. Form Factor DIMM. Total capacity of 16GB. Product type DDR3 SDRAM. Consult a specialist for assembly. 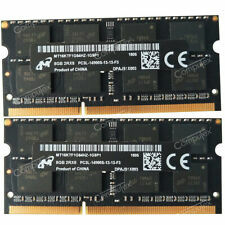 OEM Part Number: 8GB DDR3 14900R 1RX4. Rank: 1RX4. Capacity: 8GB. All of our RAM sticks are tested before dispatch. A forklift is not required. We are aware that mistakes and problems can always occur but we will endeavour to get any issue resolved as quickly and fairly as possible.